Hello Dolly! 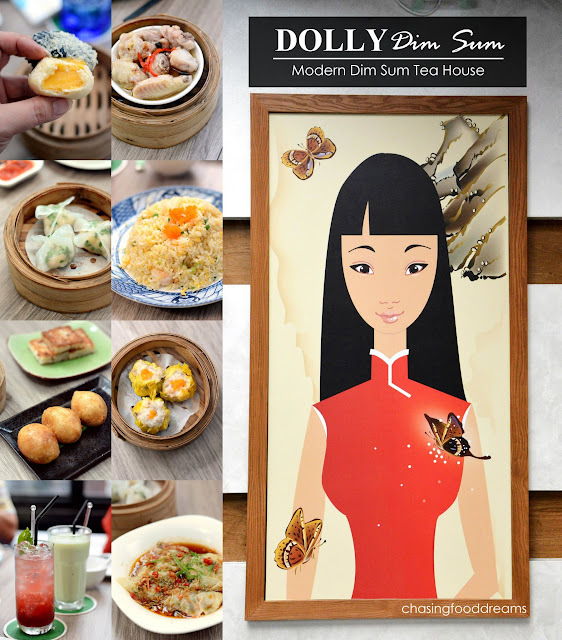 It’s dim sum set in a gorgeous modern day ambience that has many diners enjoying the much beloved dainty morsels at Dolly Dim Sum. 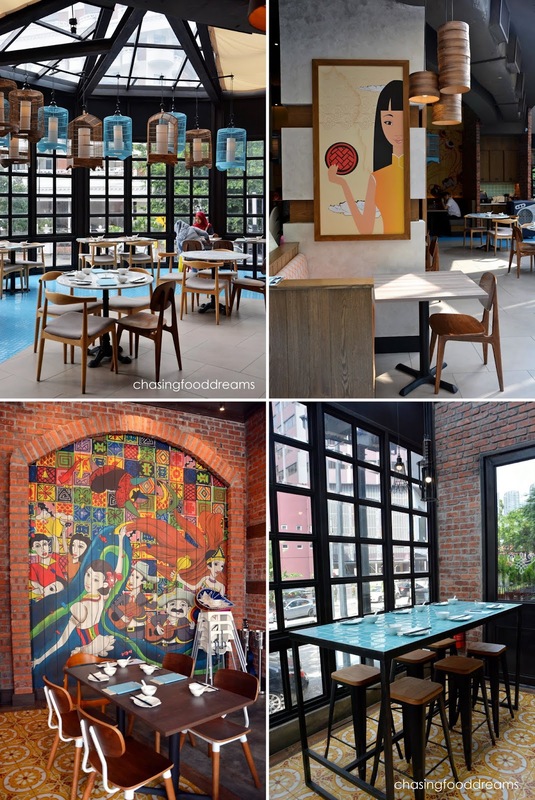 Set in the metropolitan city of KL at Avenue K Mall, Dolly Dim Sum shares the same management as Fresca, a Mexican restaurant. And that is perfectly alright since diners can actually enjoy the best of both worlds of Chinese dim sum and Mexican dishes at one meal. Dolly Dim Sum is the owners’ modern interpretation of a traditional Chinese tea house serving up delectable morsels of dim sum all day so diners can enjoy their fix throughout the day. The contemporary tea house is beautifully designed to maximize nature’s elements. 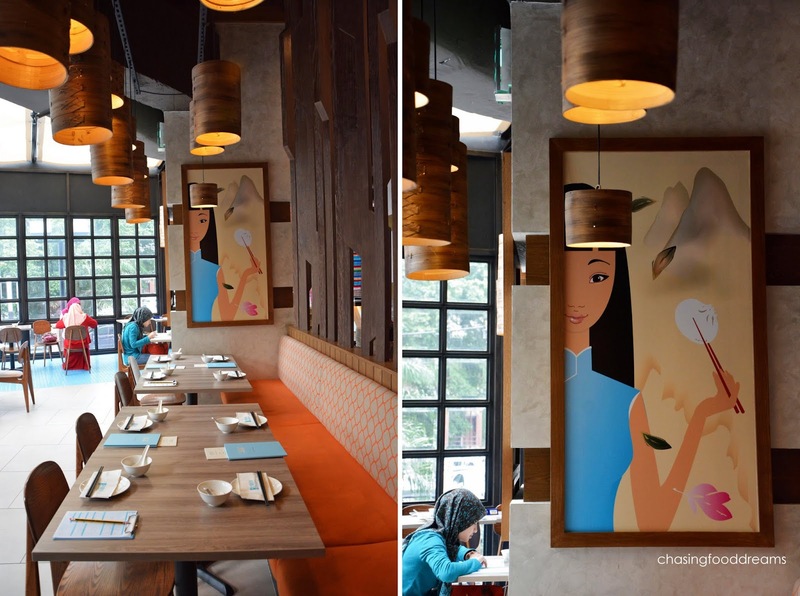 Set right next to Fresca but offers diners a breathe of vibrant freshness, Dolly Dim Sum restaurant is set with lots of glass panels to allow natural lighting to enhance the restaurant throughout the day. If one dines in the morning, one can bask in the warm bright sunlight that offers diners some natural ray of sunshine minus the heat since the restaurant is air conditioned. In the evening, the glow of the sky with stars will set the mood for a more romantic ambiance in the modern tea house. We loved the spacious scattering of seating available throughout the restaurant. Hints of bright baby blue liven up the ambiance which is set with lots of dark and light wood. From birdcages to dim sum steamers, these creative unique lightnings reminded us of yesteryear's’ elements from tea house and yet gave diners a modern sensation of artistic creativity. Many may ask who is Dolly. Well Dolly is the pretty gal seen all over the restaurant on the walls. Dolly represent the modern gal who enjoys her dim sums. The dim sums served here are in fact deemed delicate and elegant, just like Dolly! What makes Dolly Dim Sum so fun is that diners can order from Fresca while dining in Dolly as well. So this means, I get to order a Margarita to go with my hankering of dim sums. And so our dim sum party kicked off with us cheering with our Margarita (RM28.00) from the Fresca menu. Deliciously refreshing and quite boozy, we knew we were off to a great start! For those going the safer route, their Raspberry Cooler (RM10.20) & Avocado Smoothie (RM15.00) are pretty decent too. The menu at Dolly Dim Sum may not be as long as other dim sum house but it offers many classic choices sufficient to fulfill any dim sum cravings. And since this is a pork-free restaurant, Dolly Dim Sum has one of the better pork-free dim sums that I have tasted in the city. All dim sums are cooked upon order, ensuring each one is fresh and served piping hot. We started with the steamed dim sum with my all-time-favorite Siew Mai Dumpling (RM9.50). These plump dumplings had all the passing mark of a tasty and refine Siew Mai. Despite the missing swine element, the kitchen team certainly knows how to whip up a Siew Mai with a good bouncy texture. Using a mix of chicken and prawn, the Siew Mai Dumpling is moist and flavourful. Crystal Prawn Dumpling (RM9.20) is another good choice for those who enjoys the pungent notes of oniony chives with sweet juicy prawns encased in a translucent crystal skin. These had a good bouncy bite too. Dolly Dim Sum also has a decent Steamed Beef Ball (RM9.20). Not often seen in many dim houses these days, the house made beef balls are enhanced with mandarin peel to give the beef balls a hint of citrusy note. The umami notes in the beef balls is delicious while the texture is ‘QQ’ enough to pass my books. Steamed Chicken Wing (RM8.90) is one of my favorites of the lot. Chicken wing pieces are steamed with black beans, chili strips, fragrant garlic and leek oil. The flesh is so tasty and smooth. Every bite is moreish and super delicious! There’s also the spicy dim sum of Spicy Szechuan Dumpling (RM10.90) for those who likes the presence of the heat factor. Egg Custard Bun (RM7.50) is so decadent and literally luscious in flavours. Mini fluffy baos are generously filled with oozing salted egg custard cream. The savory and sweet custard is so creamy and sinful. If you love salted egg like me, make sure to order this..
Mini Dolly Cupcake (RM6.90) is Dolly Dim Sum’s version of steamed brown sugar cake or ‘Ma Lai Gao’. The light and fluffy cupcake is not too bad. Simple and studded with pumpkin seeds, the cupcakes have a lighter flavour than the classic ones that I am used too. On to the fried dim sums, we savored their Chewy Meat Croquette (RM8.60). An old school classic, ‘Ham Sui Kok’ showcase savory meat filling encased in a lightly chewy glutinous rice shell and fried. It has a nice savory robust flavour and the textures of the meat and skin is a good and unique combo. Dolly Mozza Roll (RM11.50) may not be old school but I certainly am not complaining! I like this dim sum a lot. Sweet juicy prawns with mozzarella cheese is wrapped with bean curd skin and fried to golden brown. The oozy cheese and prawn is a winner while the crispy skin definitely added extra points to the dim sum. Another dish worth ordering is the Pan Fried Radish Cake (RM8.60). Steamed radish cake studded with dried shrimps and dried scallops are pan seared until it has a nice crisp skin. The contrasting crisp layer with the soft creamy center is so delicious. It has good robust savory flavours too. Dried Scallop & Shandong Peanut Porridge (RM12.80) had us enjoying silky smooth congee flavoured with dried scallop and chicken essence. It is served with peanuts, julienned ginger, scallions and sesame oil. Crispy Egg Noodles (RM25.20) is also very flavourful. Thin crispy egg noodles are nicely sauced up with silky starchy gravy cooked with chicken, mushrooms and vegetables. This one makes good filler too and is a nice comfort food when you want something light. So whenever you happen to be in the city and is craving for dim sum at any time of the day, head over to Dolly Dim Sum for a Chinese dim sum tea house with a modern twist. And while you are there, go ahead and order a few cocktails or Mexican bites to add more spice to your dim sum meal!